Just found these ticket stubs floating around in one of my closets at home. 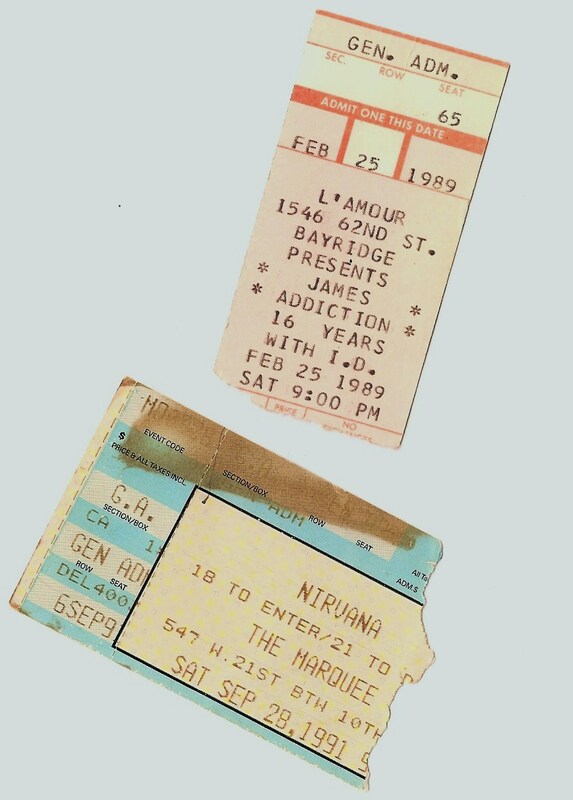 Notice how the L'amour ticket actually says James Addiction rather than Jane's Addiction. Ooops. I remember this show well. It was my first experience with the terror of realizing that someone in the pit had a knife and with the frenzy of people pushing, shoving, and doing there own versions of dancing, that there was no way of telling who it was with the knife to avoid them. I opted rather quickly to stand on the outer edges of the crowd and skip the whole trying to rock out thing. Demolition Boy opened up but I don't remember a damn thing about them. This Nirvana / Melvins show wasn't really a fond memory. I has spent the years leading up to it seeing both bands play at tiny venues where I was just a few feet away from them on stage. This was the first time I was seeing both bands in a bigger, less personal space and it was definitely the first (big) hint that Nirvana was about to become superstars.